Moldy siding can happen to any kind of siding if the right conditions are there. This can start out as an eyesore, but can turn into a nightmare if it gets ignored for too long. While moldy siding is common, there are many simple ways to avoid or eliminate mold. 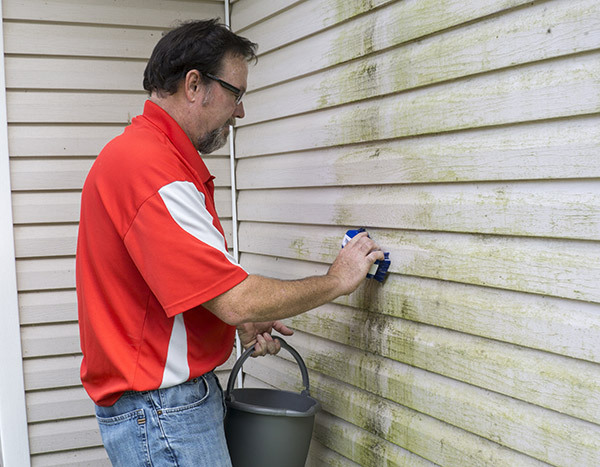 Here are some tips to help prevent moldy siding. Gutters are a very helpful tool to have, but they do require some maintenance. If you don’t adequately clean your gutters, or don’t clean them often enough, they can get clogged with leaves and other debris. Once you have a clog in your gutters they can force rainwater to overflow or leak from specific areas creating an excellent habitat for mold to grow. You’ll also want to regularly inspect your gutters for other signs of damage. Cracks or gaps can occur from extreme weather or simply from normal wear and tear. These openings create a perfect place for water to run out of the gutter, and onto your siding. Prevent moldy siding with regular gutter maintenance and inspection. It can save you time and money in the long run. Mold and mildew thrive in warm, humid climates, especially in dark or shaded areas. While you can’t control the climate, you can reduce the amount of shaded areas around your house. Overly shaded areas promote water conservation making it a great place for mold to flourish. If you’re planting trees or bushes try to keep them at a greater distance from your home. You don’t want to place them so close that their branches will brush up against the side of your home. Planting too closely to your home doesn’t allow proper air circulation causing damp air to get trapped between them and your home. Complete removal of an existing tree is typically unnecessary. If you already have mature trees around your home that you want to keep, you can prune them. If you reduce the size of their canopy you will increase the amount of sunlight. Increased sunlight will not only improve your lawn but will also make a less desirable habitat for mold and mildew. Your ventilation ducts can also create areas of moisture. Since these vents lead directly to your dryer, which is often filled with wet clothes, the moisture can build up as it leaves the vent. It’s important to regularly check the siding around your dryer vent to make sure that excess water isn’t building up. If too much water accumulates it can lead to mold and mildew growth on that area of your siding. Any additional water on the exterior of your home is a great way for mold to start. 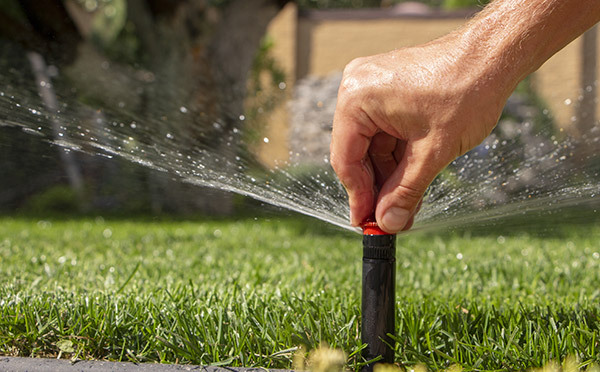 Sprinkler heads can be knocked out of position easily, so check them regularly to ensure that the amount of water that hits your house is minimal. Mold and mildew can show up on all types of siding if the conditions are right. Materials like wood tend to be more susceptible to molding and brick is difficult to clean once mold is present. Vinyl siding can still become moldy, but it’s easier to clean and more durable than most, this makes it a great choice when re-siding your home. Weather barriers are a wrap around your home between the siding and the exterior of your home. These wraps weren’t a requirement for many years, but they can save you from a mold nightmare. Weather barriers are water resistant and help to protect the more vulnerable materials that make up your home, such as wood. If your siding does become moldy, and there isn’t a weather barrier between your house and the siding, the mold can seep deeper into your home creating a bigger problem that’s way more difficult to correct. Check your siding regularly for the start of mold growth. Catching it early on will save you the time and energy in the long run. 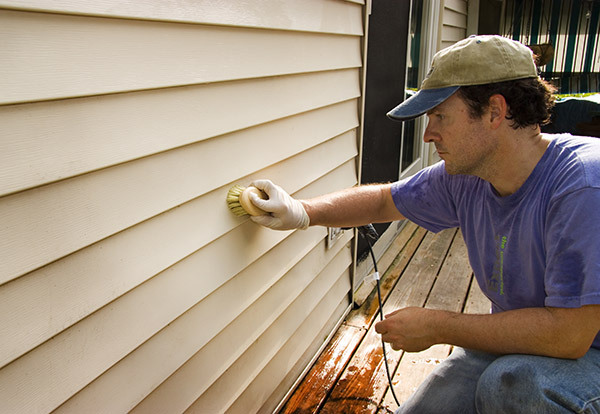 When cleaning your siding it is best to use a mild soap and only the pressure of a garden hose. Using a pressure washer or a hose nozzle on a harsh setting can create more damage to your siding than was initially there. Check out this article for a list of the best cleaning solutions. If you’re considering painting your home, using paint with mildewcide can be a great way to prevent moldy siding from occurring. Paint can be purchased with mildewcide already in it, or you can buy it separately and add it to any paint you want. It wont compromise the color or effectiveness of the paint, but it will make it more difficult for mold and mildew to show up. If you aren’t painting your home any time soon you can use products like Wet and Forget to prevent mold and even eliminate existing mold. Spray Wet and Forget over your existing siding to remove mold without having to scrub it off by hand. It will also make your siding less likely to develop mold growth in the future. You should get into the habit of visually inspecting your siding regularly to catch mold growth right when it starts. When you discover mold on your siding it is important to take care of it quickly so that it doesn’t get worse. Mold and mildew grow best in moist and shady areas, so keep an eye on areas of your home that are more exposed to those conditions. Check your dryer vent regularly as well to make sure it’s clear and not causing water to collect on the siding below it. You can help prevent moldy siding by replacing it with vinyl. Vinyl is a great option if your home is prone to mold and mildew. It’s durable and easy to clean. If your siding is beyond repair and ready to be replaced, set up a free quote with Feldco today! Feldco offers vinyl siding in many different colors and styles so you’re sure to find a look you like.